Forming the footings for concrete slab stoops outside of commercial and residential entrances often take crews several hours over the course of multiple days. Between setting the forms, pouring the concrete and backfilling with dirt, the process quickly becomes time-consuming in an industry where time is everything. 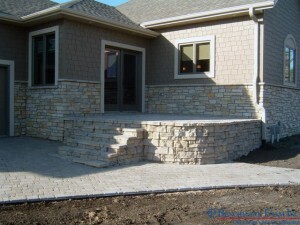 Instead of the extra time and labor, try using Benchmark Foam’s expanded polystyrene (EPS) stoop fill. It is a super lightweight material that, in a 1-step installation, is simply placed and backfilled before pouring the concrete slab. 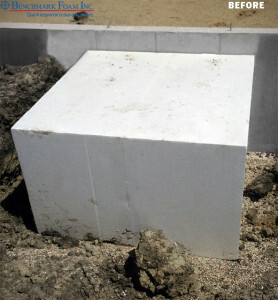 EPS is oft en used in under slab construction and can be produced at higher compressive strengths to meet your particular project needs. 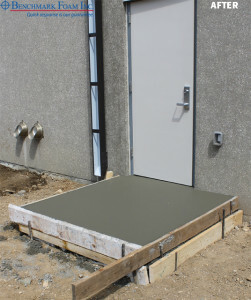 Placing concrete slabs reinforced with footings outside entry doors is a common building code and is recommended to keep the stoop safe and in place for the life of a building. For more information on EPS stoop fill, call our team at 800-658-3444 or email epsinfo@benchmarkfoam.com.